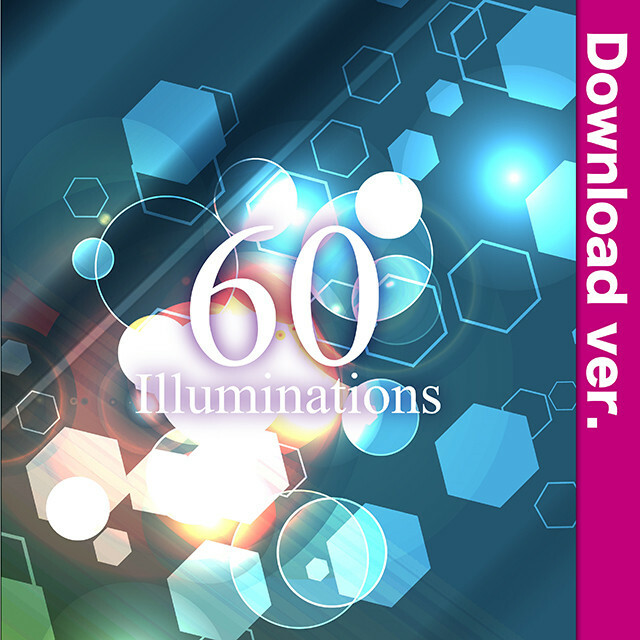 ★期間限定75%OFF★　¥400 → ¥100 イルミネーション素材集3-2／Illuminations3-2 イルミネーション、ネオン、レーザービーム、スペクトル、ボケ、スパンコール....... 光輝くイルミネーション素材を60種類収録。 レイヤー分解できるPSDファイルと、使いやすいJPG素材、カラーバリエーションを収録。 ■商用利用可、使用報告不要 レイヤーを分解・加工しても、クレジット不要です。 同人誌をはじめ、商業誌、グッズ制作、アプリ開発、webデザイン、ポスター、お品書きetc... 幅広くご利用いただけます。 ■収録枚数：60種類 豊富なカラーバリエーションのJPGも収録。 ■サイズ：A4（210mm x 297mm） ■解像度：400dpi ■収録形式：PSD（レイヤー分解）／JPG ■対応ソフト：SAI、Photoshop、Illustrator、コミスタ、イラスタ、Word、他 ■禁止事項 転売、複製、共有、そのままweb上へアップロードする行為、加工したものを素材として販売する行為、その他法令に触れる行為。 お友達に薦める際には、コピー等せず、サンプルをご利用くださいますよう宜しくお願いします。 ■発売日 2015.09.01 quantity: 60 resolution: 400dpi size: 210mm x 297mm extension: JPG, PSD(Layers) author: STARWALKER STUDIO license: PD (Public Domain) source: n/a - original work These textures are Copyright© "STARWALKER STUDIO". They have all been taken by our own cameras or created by ourselves. They are FREE to use for all uses, whether commercial or non-commercial. Feel free to take as much and as often as you like. You can NOT sell any of these textures in an unmodified form, or a modified form. You can NOT redistribute (give/send to somebody else/display on a web site) . 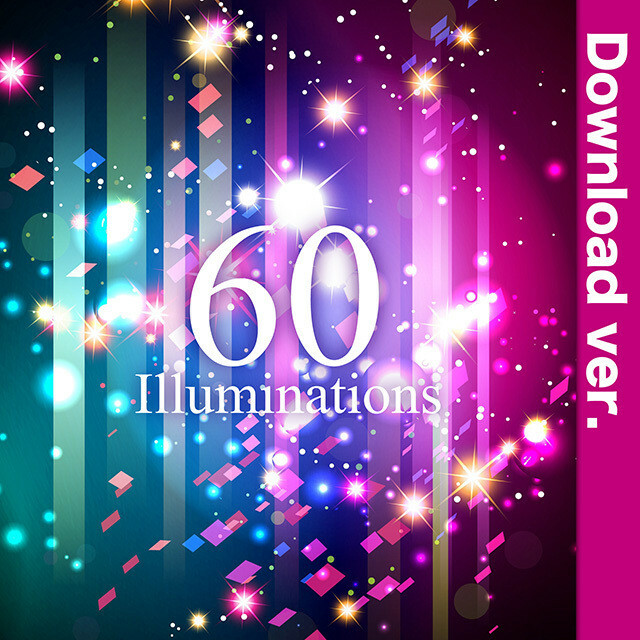 ★期間限定75%OFF★　¥400 → ¥100 イルミネーション素材集3-3／Illuminations3-3 イルミネーション、ネオン、レーザービーム、スペクトル、ボケ、スパンコール....... 光輝くイルミネーション素材を60種類収録。 レイヤー分解できるPSDファイルと、使いやすいJPG素材、カラーバリエーションを収録。 ■商用利用可、使用報告不要 レイヤーを分解・加工しても、クレジット不要です。 同人誌をはじめ、商業誌、グッズ制作、アプリ開発、webデザイン、ポスター、お品書きetc... 幅広くご利用いただけます。 ■収録枚数：60種類 豊富なカラーバリエーションのJPGも収録。 ■サイズ：A4（210mm x 297mm） ■解像度：400dpi ■収録形式：PSD（レイヤー分解）／JPG ■対応ソフト：SAI、Photoshop、Illustrator、コミスタ、イラスタ、Word、他 ■禁止事項 転売、複製、共有、そのままweb上へアップロードする行為、加工したものを素材として販売する行為、その他法令に触れる行為。 お友達に薦める際には、コピー等せず、サンプルをご利用くださいますよう宜しくお願いします。 ■発売日 2015.09.01 quantity: 60 resolution: 400dpi size: 210mm x 297mm extension: JPG, PSD(Layers) author: STARWALKER STUDIO license: PD (Public Domain) source: n/a - original work These textures are Copyright© "STARWALKER STUDIO". They have all been taken by our own cameras or created by ourselves. They are FREE to use for all uses, whether commercial or non-commercial. Feel free to take as much and as often as you like. You can NOT sell any of these textures in an unmodified form, or a modified form. You can NOT redistribute (give/send to somebody else/display on a web site) . 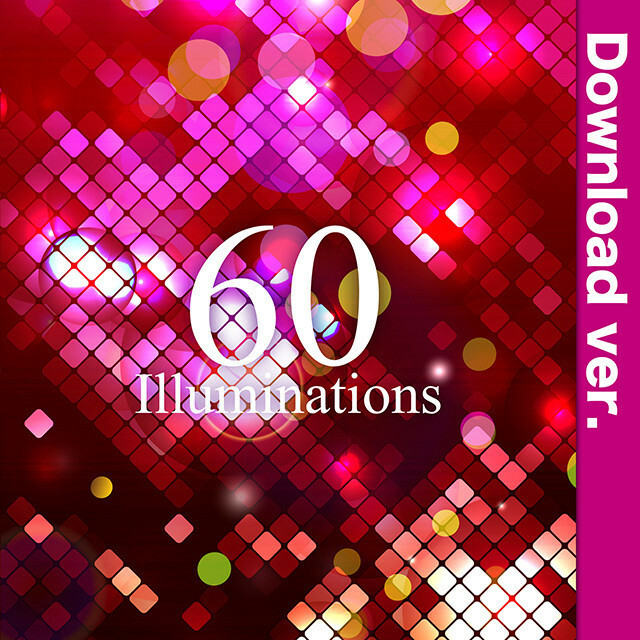 ★期間限定75%OFF★　¥400 → ¥100 イルミネーション素材集3-4／Illuminations3-4 イルミネーション、ネオン、レーザービーム、スペクトル、ボケ、スパンコール....... 光輝くイルミネーション素材を60種類収録。 レイヤー分解できるPSDファイルと、使いやすいJPG素材、カラーバリエーションを収録。 ■商用利用可、使用報告不要 レイヤーを分解・加工しても、クレジット不要です。 同人誌をはじめ、商業誌、グッズ制作、アプリ開発、webデザイン、ポスター、お品書きetc... 幅広くご利用いただけます。 ■収録枚数：60種類 豊富なカラーバリエーションのJPGも収録。 ■サイズ：A4（210mm x 297mm） ■解像度：400dpi ■収録形式：PSD（レイヤー分解）／JPG ■対応ソフト：SAI、Photoshop、Illustrator、コミスタ、イラスタ、Word、他 ■禁止事項 転売、複製、共有、そのままweb上へアップロードする行為、加工したものを素材として販売する行為、その他法令に触れる行為。 お友達に薦める際には、コピー等せず、サンプルをご利用くださいますよう宜しくお願いします。 ■発売日 2015.09.01 quantity: 60 resolution: 400dpi size: 210mm x 297mm extension: JPG, PSD(Layers) author: STARWALKER STUDIO license: PD (Public Domain) source: n/a - original work These textures are Copyright© "STARWALKER STUDIO". They have all been taken by our own cameras or created by ourselves. They are FREE to use for all uses, whether commercial or non-commercial. Feel free to take as much and as often as you like. You can NOT sell any of these textures in an unmodified form, or a modified form. You can NOT redistribute (give/send to somebody else/display on a web site) . 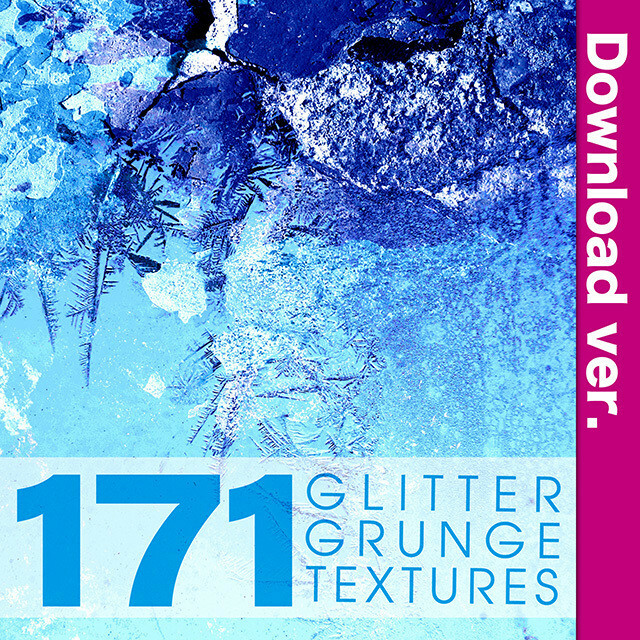 ★期間限定75%OFF★　¥400 → ¥100 キラキラ汚れ素材集2-1／GlitterGrunge_2-1 暗闇で美しく煌めくテクスチャー素材集。 商用利用可、使用報告不要！　豊富なカラーバリエーションJPGも収録。 A4サイズ400dpiの高解像度で、大判ポスターにも対応。 ■収録枚数 171種類 ■収録形式 JPG ■サイズ A4（210mm×294mm） ■解像度 400dpi ■対応ソフト：SAI、Photoshop、Illustrator、コミスタ、イラスタ、Word、他 ■商用利用可、使用報告不要 クレジット不要です。 同人誌をはじめ、商業誌、グッズ制作、アプリ開発、webデザイン、ポスター、お品書きetc... 幅広くご利用いただけます。 ■禁止事項 転売、複製、共有、そのままweb上へアップロードする行為、加工したものを素材として販売する行為、その他法令に触れる行為。 ■発売日 2016.01.01 quantity:171 resolution: 400dpi extension: JPG author: STARWALKER STUDIO license: PD (Public Domain) source: n/a - original work These textures are Copyright© "STARWALKER STUDIO". They have all been taken by our own cameras or created by ourselves. They are FREE to use for all uses, whether commercial or non-commercial. Feel free to take as much and as often as you like. You can NOT sell any of these textures in an unmodified form, or a modified form. You can NOT redistribute (give/send to somebody else/display on a web site) . 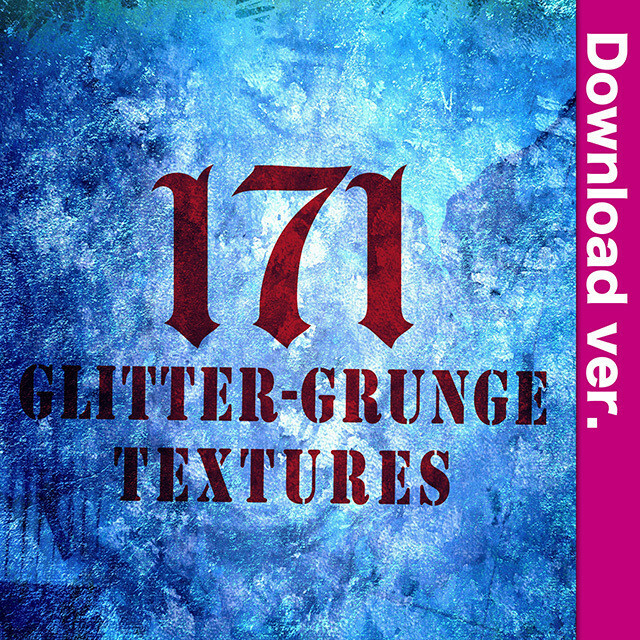 ★期間限定75%OFF★　¥400 → ¥100 キラキラ汚れ素材集2-2／GlitterGrunge_2-2 暗闇で美しく煌めくテクスチャー素材集。 商用利用可、使用報告不要！　豊富なカラーバリエーションJPGも収録。 A4サイズ400dpiの高解像度で、大判ポスターにも対応。 ■収録枚数 171種類 ■収録形式 JPG ■サイズ A4（210mm×294mm） ■解像度 400dpi ■対応ソフト：SAI、Photoshop、Illustrator、コミスタ、イラスタ、Word、他 ■商用利用可、使用報告不要 クレジット不要です。 同人誌をはじめ、商業誌、グッズ制作、アプリ開発、webデザイン、ポスター、お品書きetc... 幅広くご利用いただけます。 ■禁止事項 転売、複製、共有、そのままweb上へアップロードする行為、加工したものを素材として販売する行為、その他法令に触れる行為。 ■発売日 2016.01.01 quantity:171 resolution: 400dpi extension: JPG author: STARWALKER STUDIO license: PD (Public Domain) source: n/a - original work These textures are Copyright© "STARWALKER STUDIO". They have all been taken by our own cameras or created by ourselves. They are FREE to use for all uses, whether commercial or non-commercial. Feel free to take as much and as often as you like. You can NOT sell any of these textures in an unmodified form, or a modified form. You can NOT redistribute (give/send to somebody else/display on a web site) . 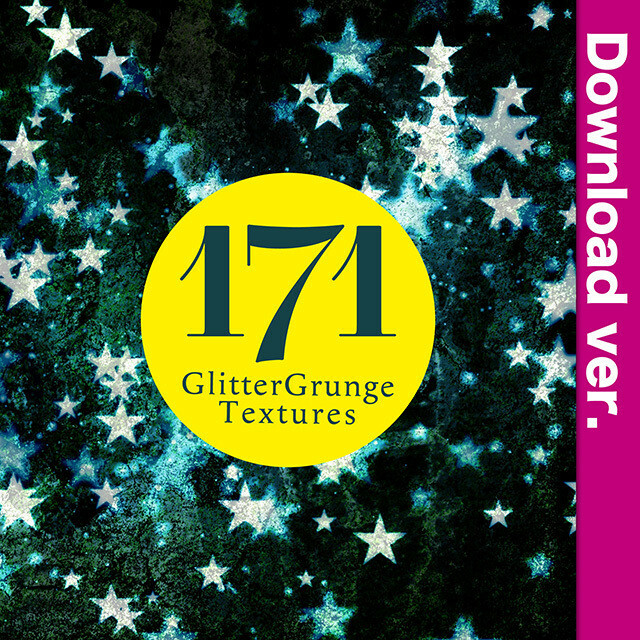 ★期間限定75%OFF★　¥400 → ¥100 キラキラ汚れ素材集2-3／GlitterGrunge_2-3 暗闇で美しく煌めくテクスチャー素材集。 商用利用可、使用報告不要！　豊富なカラーバリエーションJPGも収録。 A4サイズ400dpiの高解像度で、大判ポスターにも対応。 ■収録枚数 171種類 ■収録形式 JPG ■サイズ A4（210mm×294mm） ■解像度 400dpi ■対応ソフト：SAI、Photoshop、Illustrator、コミスタ、イラスタ、Word、他 ■商用利用可、使用報告不要 クレジット不要です。 同人誌をはじめ、商業誌、グッズ制作、アプリ開発、webデザイン、ポスター、お品書きetc... 幅広くご利用いただけます。 ■禁止事項 転売、複製、共有、そのままweb上へアップロードする行為、加工したものを素材として販売する行為、その他法令に触れる行為。 ■発売日 2016.01.01 quantity:171 resolution: 400dpi extension: JPG author: STARWALKER STUDIO license: PD (Public Domain) source: n/a - original work These textures are Copyright© "STARWALKER STUDIO". They have all been taken by our own cameras or created by ourselves. They are FREE to use for all uses, whether commercial or non-commercial. Feel free to take as much and as often as you like. You can NOT sell any of these textures in an unmodified form, or a modified form. You can NOT redistribute (give/send to somebody else/display on a web site) . 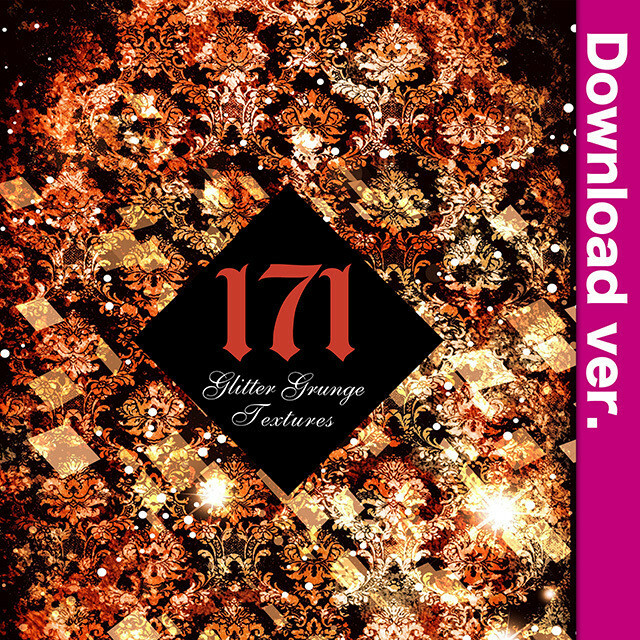 ★期間限定75%OFF★　¥400 → ¥100 キラキラ汚れ素材集2-4／GlitterGrunge_2-4 暗闇で美しく煌めくテクスチャー素材集。 商用利用可、使用報告不要！　豊富なカラーバリエーションJPGも収録。 A4サイズ400dpiの高解像度で、大判ポスターにも対応。 ■収録枚数 171種類 ■収録形式 JPG ■サイズ A4（210mm×294mm） ■解像度 400dpi ■対応ソフト：SAI、Photoshop、Illustrator、コミスタ、イラスタ、Word、他 ■商用利用可、使用報告不要 クレジット不要です。 同人誌をはじめ、商業誌、グッズ制作、アプリ開発、webデザイン、ポスター、お品書きetc... 幅広くご利用いただけます。 ■禁止事項 転売、複製、共有、そのままweb上へアップロードする行為、加工したものを素材として販売する行為、その他法令に触れる行為。 ■発売日 2016.01.01 quantity:171 resolution: 400dpi extension: JPG author: STARWALKER STUDIO license: PD (Public Domain) source: n/a - original work These textures are Copyright© "STARWALKER STUDIO". They have all been taken by our own cameras or created by ourselves. They are FREE to use for all uses, whether commercial or non-commercial. Feel free to take as much and as often as you like. You can NOT sell any of these textures in an unmodified form, or a modified form. You can NOT redistribute (give/send to somebody else/display on a web site) . 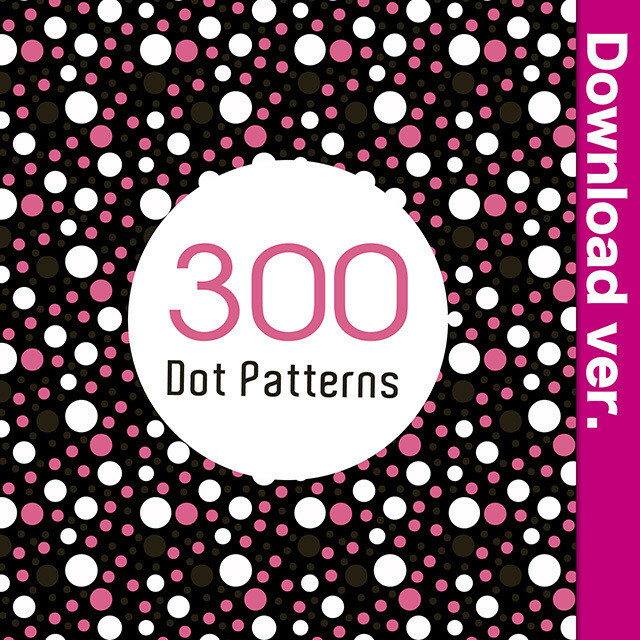 ★期間限定75%OFF★　¥400 → ¥100 水玉素材集2-1／Dot Patterns_2-1 ポップで可愛い水玉素材900種類。 パスを加工できるEPS、PSDも収録！ A4よりも大きな300mm x 300mm、とても使いやすいループ素材になっています。 ■収録枚数：300種類 ■サイズ：300mm x 300mm ■解像度：400dpi ■収録形式：PSD（レイヤー分解）／PNG（背景透過）／EPS（Illustrator9.0以降） ■対応ソフト：SAI、Photoshop、Illustrator、コミスタ、イラスタ、Word、他 ■商用利用可、使用報告不要 クレジット不要です。 同人誌をはじめ、商業誌、グッズ制作、アプリ開発、webデザイン、ポスター、お品書きetc... 幅広くご利用いただけます。 ■禁止事項 転売、複製、共有、そのままweb上へアップロードする行為、加工したものを素材として販売する行為、その他法令に触れる行為。 ■発売日 2016.01.01 quantity: 300 resolution: 400dpi extension: PNG（masked）／EPS（Illustrator9.0）／PSD(Layers) author: STARWALKER STUDIO license: PD (Public Domain) source: n/a - original work These textures are Copyright© "STARWALKER STUDIO". They have all been taken by our own cameras or created by ourselves. They are FREE to use for all uses, whether commercial or non-commercial. Feel free to take as much and as often as you like. You can NOT sell any of these textures in an unmodified form, or a modified form. You can NOT redistribute (give/send to somebody else/display on a web site) . 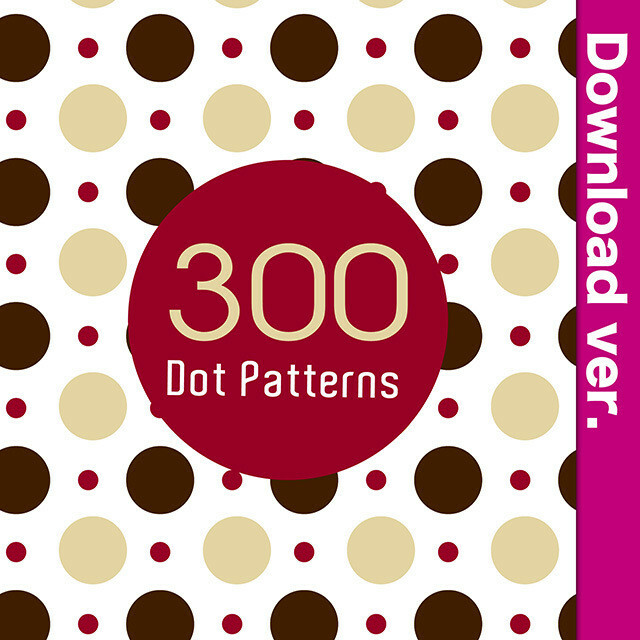 ★期間限定75%OFF★　¥400 → ¥100 水玉素材集2-2／Dot Patterns_2-2 ポップで可愛い水玉素材900種類。 パスを加工できるEPS、PSDも収録！ A4よりも大きな300mm x 300mm、とても使いやすいループ素材になっています。 ■収録枚数：300種類 ■サイズ：300mm x 300mm ■解像度：400dpi ■収録形式：PSD（レイヤー分解）／PNG（背景透過）／EPS（Illustrator9.0以降） ■対応ソフト：SAI、Photoshop、Illustrator、コミスタ、イラスタ、Word、他 ■商用利用可、使用報告不要 クレジット不要です。 同人誌をはじめ、商業誌、グッズ制作、アプリ開発、webデザイン、ポスター、お品書きetc... 幅広くご利用いただけます。 ■禁止事項 転売、複製、共有、そのままweb上へアップロードする行為、加工したものを素材として販売する行為、その他法令に触れる行為。 ■発売日 2016.01.01 quantity: 300 resolution: 400dpi extension: PNG（masked）／EPS（Illustrator9.0）／PSD(Layers) author: STARWALKER STUDIO license: PD (Public Domain) source: n/a - original work These textures are Copyright© "STARWALKER STUDIO". They have all been taken by our own cameras or created by ourselves. They are FREE to use for all uses, whether commercial or non-commercial. Feel free to take as much and as often as you like. You can NOT sell any of these textures in an unmodified form, or a modified form. You can NOT redistribute (give/send to somebody else/display on a web site) . 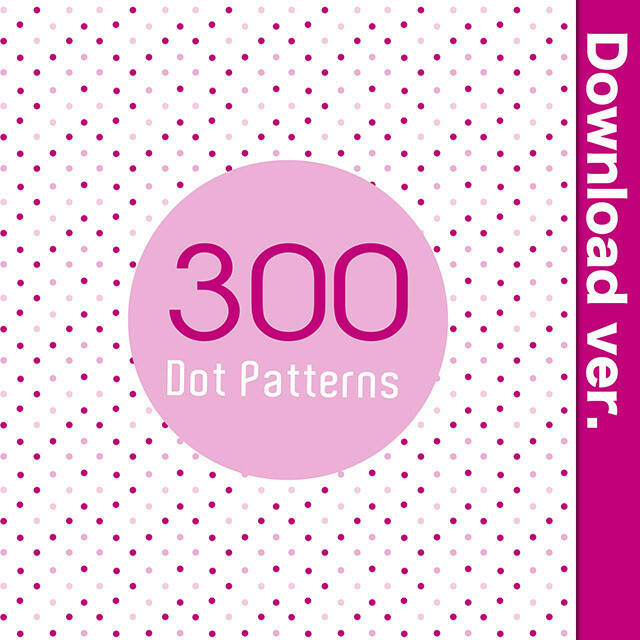 ★期間限定75%OFF★　¥400 → ¥100 水玉素材集2-3／Dot Patterns_2-3 ポップで可愛い水玉素材900種類。 パスを加工できるEPS、PSDも収録！ A4よりも大きな300mm x 300mm、とても使いやすいループ素材になっています。 ■収録枚数：300種類 ■サイズ：300mm x 300mm ■解像度：400dpi ■収録形式：PSD（レイヤー分解）／PNG（背景透過）／EPS（Illustrator9.0以降） ■対応ソフト：SAI、Photoshop、Illustrator、コミスタ、イラスタ、Word、他 ■商用利用可、使用報告不要 クレジット不要です。 同人誌をはじめ、商業誌、グッズ制作、アプリ開発、webデザイン、ポスター、お品書きetc... 幅広くご利用いただけます。 ■禁止事項 転売、複製、共有、そのままweb上へアップロードする行為、加工したものを素材として販売する行為、その他法令に触れる行為。 ■発売日 2016.01.01 quantity: 300 resolution: 400dpi extension: PNG（masked）／EPS（Illustrator9.0）／PSD(Layers) author: STARWALKER STUDIO license: PD (Public Domain) source: n/a - original work These textures are Copyright© "STARWALKER STUDIO". They have all been taken by our own cameras or created by ourselves. They are FREE to use for all uses, whether commercial or non-commercial. Feel free to take as much and as often as you like. You can NOT sell any of these textures in an unmodified form, or a modified form. You can NOT redistribute (give/send to somebody else/display on a web site) . 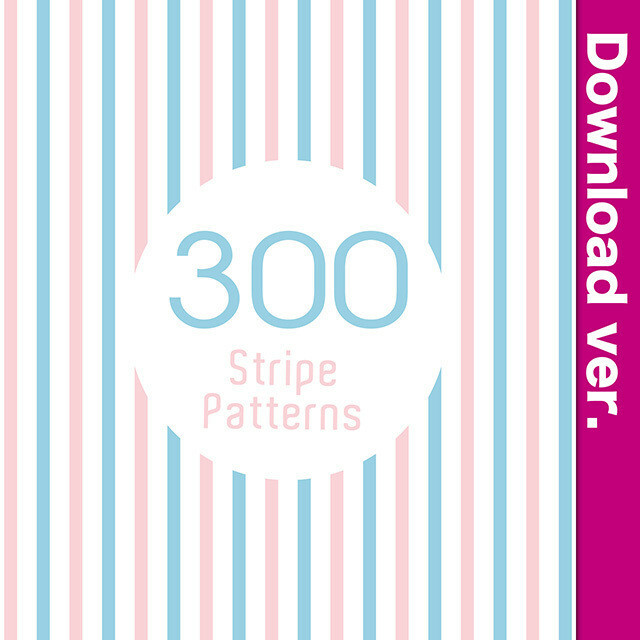 ★期間限定75%OFF★　¥400 → ¥100 ストライプ素材集2-1／Stripe Patterns_2-1 シンプルおしゃれ可愛いストライプ300種類。 パスを加工できるEPS、PSDも収録！ A4よりも大きな300mm x 300mm、とても使いやすいループ素材になっています。 ■収録枚数：300種類 ■サイズ：300mm x 300mm ■解像度：400dpi ■収録形式：PSD（レイヤー分解）／PNG（背景透過）／EPS（Illustrator9.0以降） ■対応ソフト：SAI、Photoshop、Illustrator、コミスタ、イラスタ、Word、他 ■商用利用可、使用報告不要 クレジット不要です。 同人誌をはじめ、商業誌、グッズ制作、アプリ開発、webデザイン、ポスター、お品書きetc... 幅広くご利用いただけます。 ■禁止事項 転売、複製、共有、そのままweb上へアップロードする行為、加工したものを素材として販売する行為、その他法令に触れる行為。 ■発売日 2016.01.01 quantity: 300 resolution: 400dpi extension: PNG（masked）／EPS（Illustrator9.0）／PSD(Layers) author: STARWALKER STUDIO license: PD (Public Domain) source: n/a - original work These textures are Copyright© "STARWALKER STUDIO". They have all been taken by our own cameras or created by ourselves. They are FREE to use for all uses, whether commercial or non-commercial. Feel free to take as much and as often as you like. You can NOT sell any of these textures in an unmodified form, or a modified form. You can NOT redistribute (give/send to somebody else/display on a web site) . 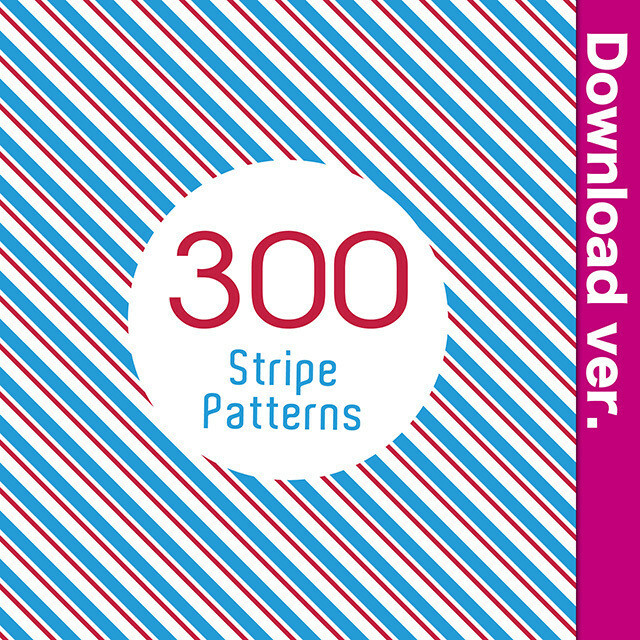 ★期間限定75%OFF★　¥400 → ¥100 ストライプ素材集2-2／Stripe Patterns_2-2 シンプルおしゃれ可愛いストライプ300種類。 パスを加工できるEPS、PSDも収録！ A4よりも大きな300mm x 300mm、とても使いやすいループ素材になっています。 ■収録枚数：300種類 ■サイズ：300mm x 300mm ■解像度：400dpi ■収録形式：PSD（レイヤー分解）／PNG（背景透過）／EPS（Illustrator9.0以降） ■対応ソフト：SAI、Photoshop、Illustrator、コミスタ、イラスタ、Word、他 ■商用利用可、使用報告不要 クレジット不要です。 同人誌をはじめ、商業誌、グッズ制作、アプリ開発、webデザイン、ポスター、お品書きetc... 幅広くご利用いただけます。 ■禁止事項 転売、複製、共有、そのままweb上へアップロードする行為、加工したものを素材として販売する行為、その他法令に触れる行為。 ■発売日 2016.01.01 quantity: 300 resolution: 400dpi extension: PNG（masked）／EPS（Illustrator9.0）／PSD(Layers) author: STARWALKER STUDIO license: PD (Public Domain) source: n/a - original work These textures are Copyright© "STARWALKER STUDIO". They have all been taken by our own cameras or created by ourselves. They are FREE to use for all uses, whether commercial or non-commercial. Feel free to take as much and as often as you like. You can NOT sell any of these textures in an unmodified form, or a modified form. You can NOT redistribute (give/send to somebody else/display on a web site) . 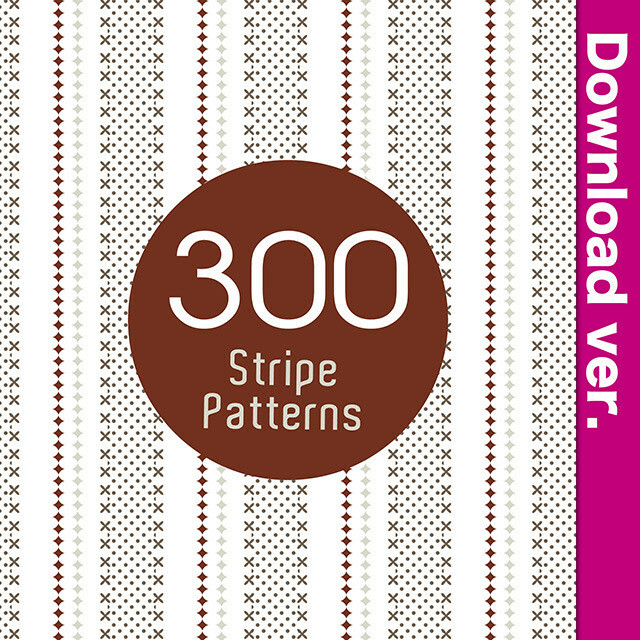 ★期間限定75%OFF★　¥400 → ¥100 ストライプ素材集2-3／Stripe Patterns_2-3 シンプルおしゃれ可愛いストライプ300種類。 パスを加工できるEPS、PSDも収録！ A4よりも大きな300mm x 300mm、とても使いやすいループ素材になっています。 ■収録枚数：300種類 ■サイズ：300mm x 300mm ■解像度：400dpi ■収録形式：PSD（レイヤー分解）／PNG（背景透過）／EPS（Illustrator9.0以降） ■対応ソフト：SAI、Photoshop、Illustrator、コミスタ、イラスタ、Word、他 ■商用利用可、使用報告不要 クレジット不要です。 同人誌をはじめ、商業誌、グッズ制作、アプリ開発、webデザイン、ポスター、お品書きetc... 幅広くご利用いただけます。 ■禁止事項 転売、複製、共有、そのままweb上へアップロードする行為、加工したものを素材として販売する行為、その他法令に触れる行為。 ■発売日 2016.01.01 quantity: 300 resolution: 400dpi extension: PNG（masked）／EPS（Illustrator9.0）／PSD(Layers) author: STARWALKER STUDIO license: PD (Public Domain) source: n/a - original work These textures are Copyright© "STARWALKER STUDIO". They have all been taken by our own cameras or created by ourselves. They are FREE to use for all uses, whether commercial or non-commercial. Feel free to take as much and as often as you like. You can NOT sell any of these textures in an unmodified form, or a modified form. You can NOT redistribute (give/send to somebody else/display on a web site) . 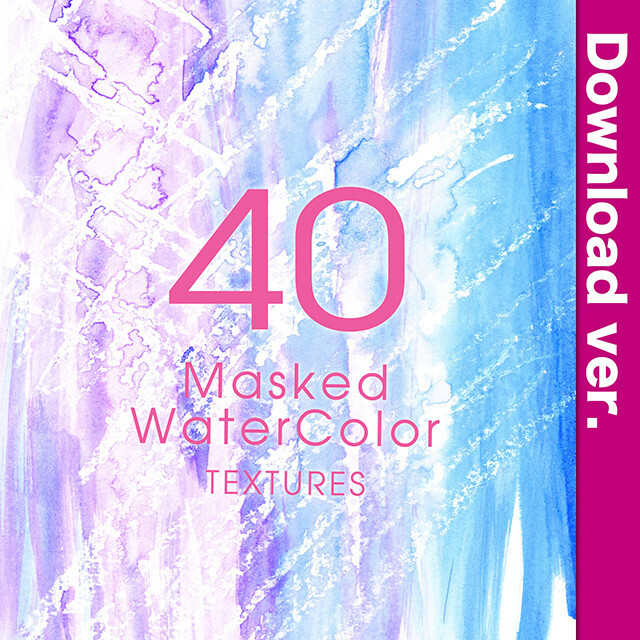 ★期間限定75%OFF★　¥400 → ¥100 透明水彩素材集3-1／MaskedWaterColor_3-1 枠、にじみ、しずく、かすれの透明水彩素材40種類。 背景が透明になっているので、そのまま使えます。 --------------------------------------------------------------------------- 『水彩素材集』と『透明水彩素材集』の違いについて 水彩素材集　→　レイヤー分解PSDを収録。パーツ分解できます。 透明水彩素材集　→　背景透過PNGを収録。 --------------------------------------------------------------------------- ■収録枚数：60種類 ■サイズ：A4 ■解像度：400dpi ■収録形式：PNG（背景透過） ■対応ソフト：SAI、Photoshop、Illustrator、コミスタ、イラスタ、Word、他 ■商用利用可、使用報告不要 クレジット不要です。 同人誌をはじめ、商業誌、グッズ制作、アプリ開発、webデザイン、ポスター、お品書きetc... 幅広くご利用いただけます。 ■禁止事項 転売、複製、共有、そのままweb上へアップロードする行為、加工したものを素材として販売する行為、その他法令に触れる行為。 ■発売日 2016.01.01 quantity: 60 resolution: 400dpi extension: PNG（masked） author: STARWALKER STUDIO license: PD (Public Domain) source: n/a - original work These textures are Copyright© "STARWALKER STUDIO". They have all been taken by our own cameras or created by ourselves. They are FREE to use for all uses, whether commercial or non-commercial. Feel free to take as much and as often as you like. You can NOT sell any of these textures in an unmodified form, or a modified form. You can NOT redistribute (give/send to somebody else/display on a web site) . 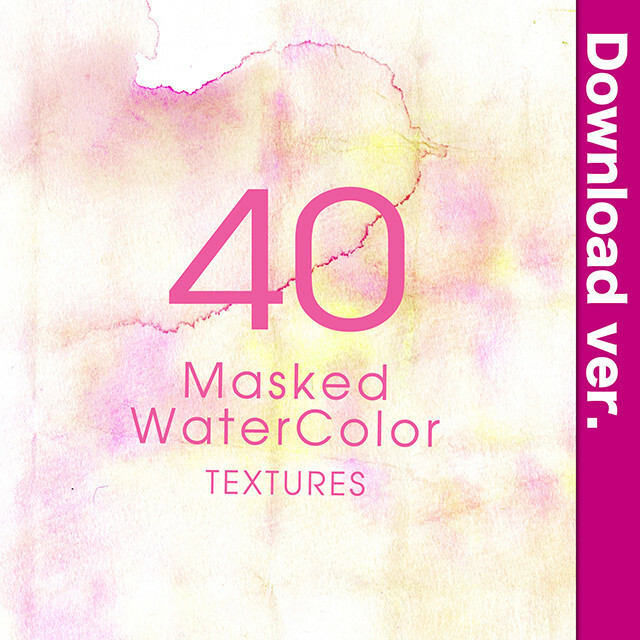 ★期間限定75%OFF★　¥400 → ¥100 透明水彩素材集3-2／MaskedWaterColor_3-2 枠、にじみ、しずく、かすれの透明水彩素材40種類。 背景が透明になっているので、そのまま使えます。 --------------------------------------------------------------------------- 『水彩素材集』と『透明水彩素材集』の違いについて 水彩素材集　→　レイヤー分解PSDを収録。パーツ分解できます。 透明水彩素材集　→　背景透過PNGを収録。 --------------------------------------------------------------------------- ■収録枚数：60種類 ■サイズ：A4 ■解像度：400dpi ■収録形式：PNG（背景透過） ■対応ソフト：SAI、Photoshop、Illustrator、コミスタ、イラスタ、Word、他 ■商用利用可、使用報告不要 クレジット不要です。 同人誌をはじめ、商業誌、グッズ制作、アプリ開発、webデザイン、ポスター、お品書きetc... 幅広くご利用いただけます。 ■禁止事項 転売、複製、共有、そのままweb上へアップロードする行為、加工したものを素材として販売する行為、その他法令に触れる行為。 ■発売日 2016.01.01 quantity: 60 resolution: 400dpi extension: PNG（masked） author: STARWALKER STUDIO license: PD (Public Domain) source: n/a - original work These textures are Copyright© "STARWALKER STUDIO". They have all been taken by our own cameras or created by ourselves. They are FREE to use for all uses, whether commercial or non-commercial. Feel free to take as much and as often as you like. You can NOT sell any of these textures in an unmodified form, or a modified form. You can NOT redistribute (give/send to somebody else/display on a web site) . 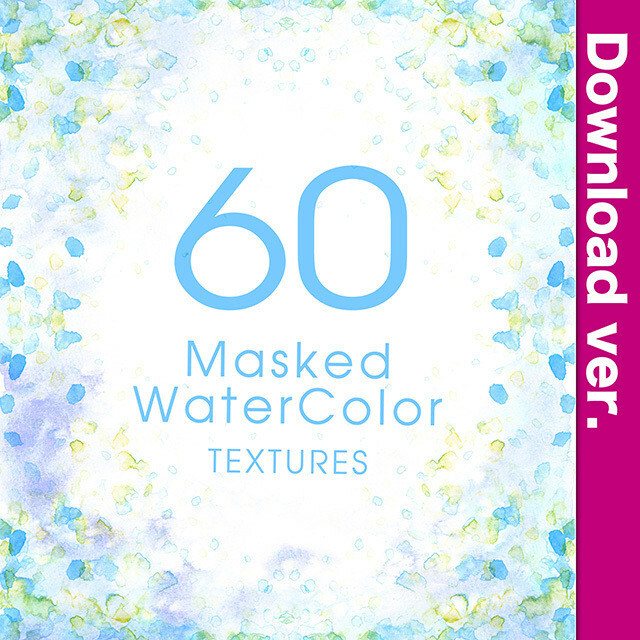 ★期間限定75%OFF★　¥400 → ¥100 透明水彩素材集3-3／MaskedWaterColor_3-3 枠、にじみ、しずく、かすれの透明水彩素材40種類。 背景が透明になっているので、そのまま使えます。 --------------------------------------------------------------------------- 『水彩素材集』と『透明水彩素材集』の違いについて 水彩素材集　→　レイヤー分解PSDを収録。パーツ分解できます。 透明水彩素材集　→　背景透過PNGを収録。 --------------------------------------------------------------------------- ■収録枚数：40種類 ■サイズ：A4 ■解像度：400dpi ■収録形式：PNG（背景透過） ■対応ソフト：SAI、Photoshop、Illustrator、コミスタ、イラスタ、Word、他 ■商用利用可、使用報告不要 クレジット不要です。 同人誌をはじめ、商業誌、グッズ制作、アプリ開発、webデザイン、ポスター、お品書きetc... 幅広くご利用いただけます。 ■禁止事項 転売、複製、共有、そのままweb上へアップロードする行為、加工したものを素材として販売する行為、その他法令に触れる行為。 ■発売日 2016.01.01 quantity: 40 resolution: 400dpi extension: PNG（masked） author: STARWALKER STUDIO license: PD (Public Domain) source: n/a - original work These textures are Copyright© "STARWALKER STUDIO". They have all been taken by our own cameras or created by ourselves. They are FREE to use for all uses, whether commercial or non-commercial. Feel free to take as much and as often as you like. You can NOT sell any of these textures in an unmodified form, or a modified form. You can NOT redistribute (give/send to somebody else/display on a web site) . 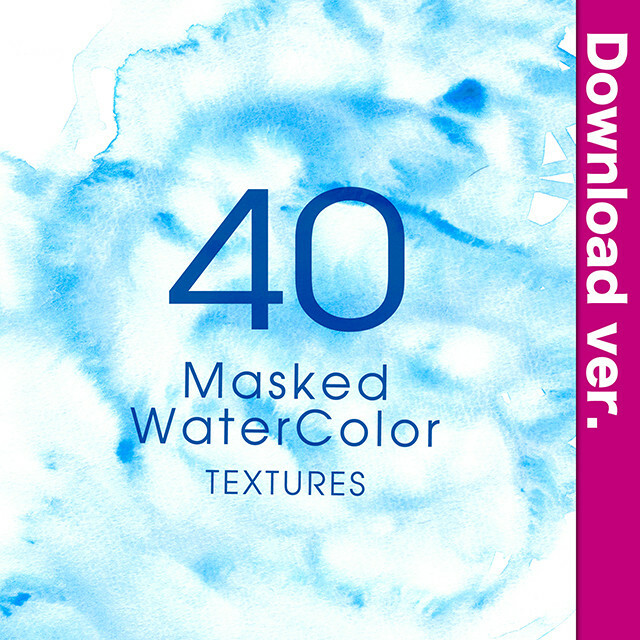 ★期間限定75%OFF★　¥400 → ¥100 透明水彩素材集3-4／MaskedWaterColor_3-4 枠、にじみ、しずく、かすれの透明水彩素材40種類。 背景が透明になっているので、そのまま使えます。 --------------------------------------------------------------------------- 『水彩素材集』と『透明水彩素材集』の違いについて 水彩素材集　→　レイヤー分解PSDを収録。パーツ分解できます。 透明水彩素材集　→　背景透過PNGを収録。 --------------------------------------------------------------------------- ■収録枚数：40種類 ■サイズ：A4 ■解像度：400dpi ■収録形式：PNG（背景透過） ■対応ソフト：SAI、Photoshop、Illustrator、コミスタ、イラスタ、Word、他 ■商用利用可、使用報告不要 クレジット不要です。 同人誌をはじめ、商業誌、グッズ制作、アプリ開発、webデザイン、ポスター、お品書きetc... 幅広くご利用いただけます。 ■禁止事項 転売、複製、共有、そのままweb上へアップロードする行為、加工したものを素材として販売する行為、その他法令に触れる行為。 ■発売日 2016.01.01 quantity: 40 resolution: 400dpi extension: PNG（masked） author: STARWALKER STUDIO license: PD (Public Domain) source: n/a - original work These textures are Copyright© "STARWALKER STUDIO". They have all been taken by our own cameras or created by ourselves. They are FREE to use for all uses, whether commercial or non-commercial. Feel free to take as much and as often as you like. You can NOT sell any of these textures in an unmodified form, or a modified form. You can NOT redistribute (give/send to somebody else/display on a web site) . 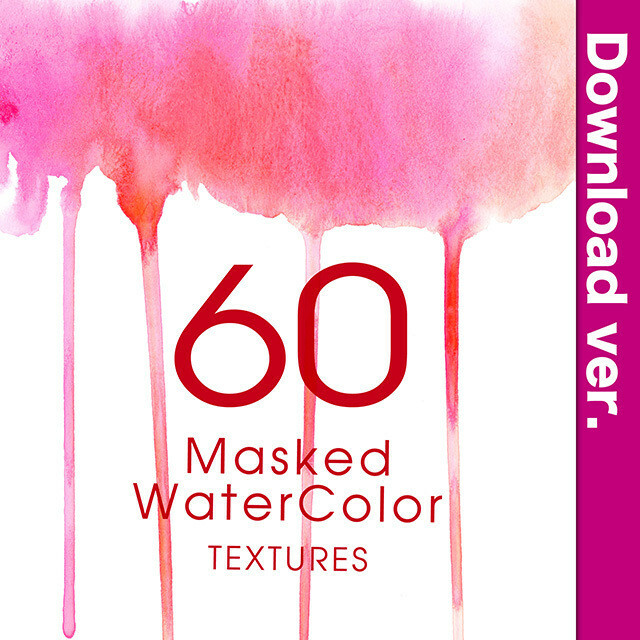 ★期間限定75%OFF★　¥400 → ¥100 透明水彩素材集3-5／MaskedWaterColor_3-5 枠、にじみ、しずく、かすれの透明水彩素材40種類。 背景が透明になっているので、そのまま使えます。 --------------------------------------------------------------------------- 『水彩素材集』と『透明水彩素材集』の違いについて 水彩素材集　→　レイヤー分解PSDを収録。パーツ分解できます。 透明水彩素材集　→　背景透過PNGを収録。 --------------------------------------------------------------------------- ■収録枚数：40種類 ■サイズ：A4 ■解像度：400dpi ■収録形式：PNG（背景透過） ■対応ソフト：SAI、Photoshop、Illustrator、コミスタ、イラスタ、Word、他 ■商用利用可、使用報告不要 クレジット不要です。 同人誌をはじめ、商業誌、グッズ制作、アプリ開発、webデザイン、ポスター、お品書きetc... 幅広くご利用いただけます。 ■禁止事項 転売、複製、共有、そのままweb上へアップロードする行為、加工したものを素材として販売する行為、その他法令に触れる行為。 ■発売日 2016.01.01 quantity: 40 resolution: 400dpi extension: PNG（masked） author: STARWALKER STUDIO license: PD (Public Domain) source: n/a - original work These textures are Copyright© "STARWALKER STUDIO". They have all been taken by our own cameras or created by ourselves. They are FREE to use for all uses, whether commercial or non-commercial. Feel free to take as much and as often as you like. You can NOT sell any of these textures in an unmodified form, or a modified form. You can NOT redistribute (give/send to somebody else/display on a web site) . 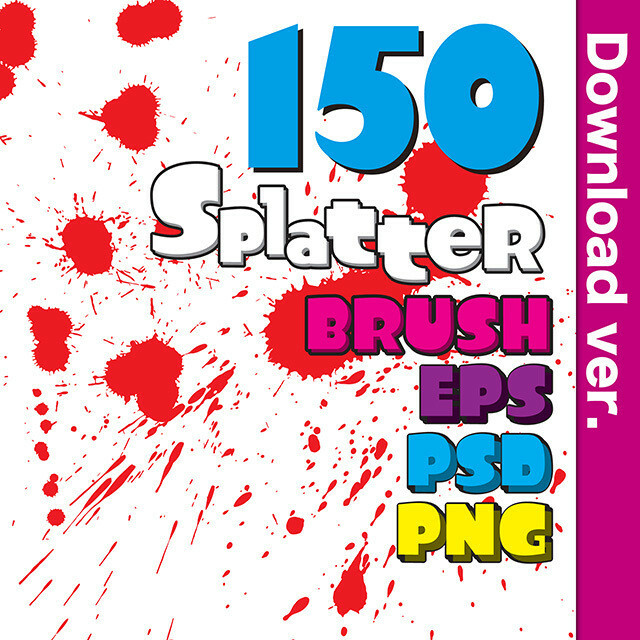 ★期間限定75%OFF★　¥400 → ¥100 しぶき素材集2-1／Splatter_Brush_2-1 しぶき、飛沫の素材を150種類。 パスを加工できるEPSも収録！ 水彩質感のあり／なし両方収録していますので、 マットなしぶきを使いたい場合も便利です。 ■収録枚数：300種類 ■解像度：400dpi ■収録形式：PNG（背景透過）／EPS（Illustrator9.0以降）／ABR（Photoshopブラシ） ■対応ソフト：SAI、Photoshop、Illustrator、コミスタ、イラスタ、Word、他 ■商用利用可、使用報告不要 クレジット不要です。 同人誌をはじめ、商業誌、グッズ制作、アプリ開発、webデザイン、ポスター、お品書きetc... 幅広くご利用いただけます。 ■禁止事項 転売、複製、共有、そのままweb上へアップロードする行為、加工したものを素材として販売する行為、その他法令に触れる行為。 ■発売日 2016.01.01 quantity: 150 resolution: 400dpi extension: PNG（masked）／EPS（Illustrator9.0）／ABR（Photoshop Brush） author: STARWALKER STUDIO license: PD (Public Domain) source: n/a - original work These textures are Copyright© "STARWALKER STUDIO". They have all been taken by our own cameras or created by ourselves. They are FREE to use for all uses, whether commercial or non-commercial. Feel free to take as much and as often as you like. You can NOT sell any of these textures in an unmodified form, or a modified form. You can NOT redistribute (give/send to somebody else/display on a web site) . 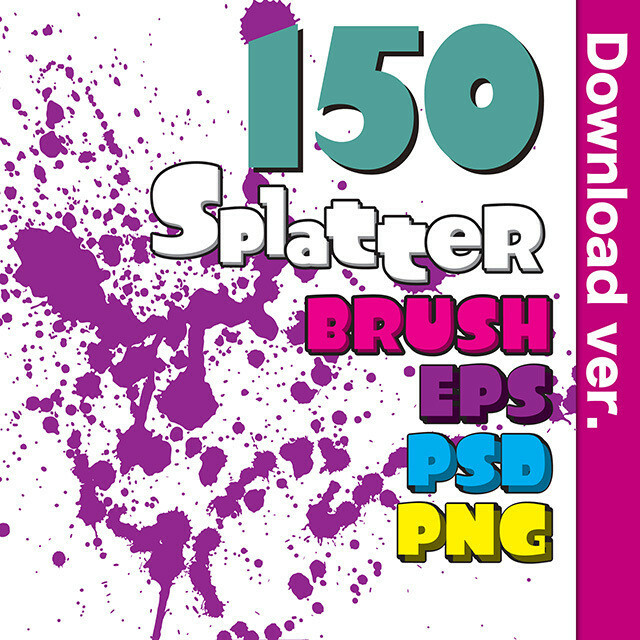 ★期間限定75%OFF★　¥400 → ¥100 しぶき素材集2-2／Splatter_Brush_2-2 しぶき、飛沫の素材を150種類。 パスを加工できるEPSも収録！ 水彩質感のあり／なし両方収録していますので、 マットなしぶきを使いたい場合も便利です。 ■収録枚数：300種類 ■解像度：400dpi ■収録形式：PNG（背景透過）／EPS（Illustrator9.0以降）／ABR（Photoshopブラシ） ■対応ソフト：SAI、Photoshop、Illustrator、コミスタ、イラスタ、Word、他 ■商用利用可、使用報告不要 クレジット不要です。 同人誌をはじめ、商業誌、グッズ制作、アプリ開発、webデザイン、ポスター、お品書きetc... 幅広くご利用いただけます。 ■禁止事項 転売、複製、共有、そのままweb上へアップロードする行為、加工したものを素材として販売する行為、その他法令に触れる行為。 ■発売日 2016.01.01 quantity: 150 resolution: 400dpi extension: PNG（masked）／EPS（Illustrator9.0）／ABR（Photoshop Brush） author: STARWALKER STUDIO license: PD (Public Domain) source: n/a - original work These textures are Copyright© "STARWALKER STUDIO". They have all been taken by our own cameras or created by ourselves. They are FREE to use for all uses, whether commercial or non-commercial. Feel free to take as much and as often as you like. You can NOT sell any of these textures in an unmodified form, or a modified form. You can NOT redistribute (give/send to somebody else/display on a web site) . 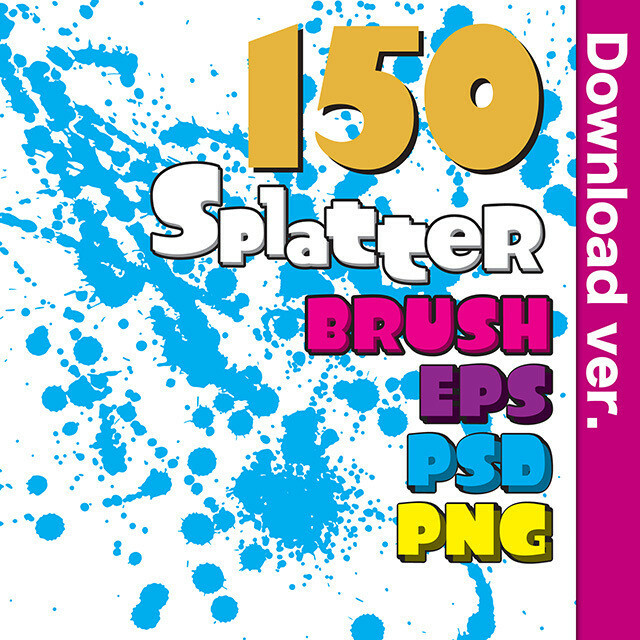 ★期間限定75%OFF★　¥400 → ¥100 しぶき素材集2-3／Splatter_Brush_2-3 しぶき、飛沫の素材を150種類。 パスを加工できるEPSも収録！ 水彩質感のあり／なし両方収録していますので、 マットなしぶきを使いたい場合も便利です。 ■収録枚数：300種類 ■解像度：400dpi ■収録形式：PNG（背景透過）／EPS（Illustrator9.0以降）／ABR（Photoshopブラシ） ■対応ソフト：SAI、Photoshop、Illustrator、コミスタ、イラスタ、Word、他 ■商用利用可、使用報告不要 クレジット不要です。 同人誌をはじめ、商業誌、グッズ制作、アプリ開発、webデザイン、ポスター、お品書きetc... 幅広くご利用いただけます。 ■禁止事項 転売、複製、共有、そのままweb上へアップロードする行為、加工したものを素材として販売する行為、その他法令に触れる行為。 ■発売日 2016.01.01 quantity: 150 resolution: 400dpi extension: PNG（masked）／EPS（Illustrator9.0）／ABR（Photoshop Brush） author: STARWALKER STUDIO license: PD (Public Domain) source: n/a - original work These textures are Copyright© "STARWALKER STUDIO". They have all been taken by our own cameras or created by ourselves. They are FREE to use for all uses, whether commercial or non-commercial. Feel free to take as much and as often as you like. You can NOT sell any of these textures in an unmodified form, or a modified form. You can NOT redistribute (give/send to somebody else/display on a web site) . 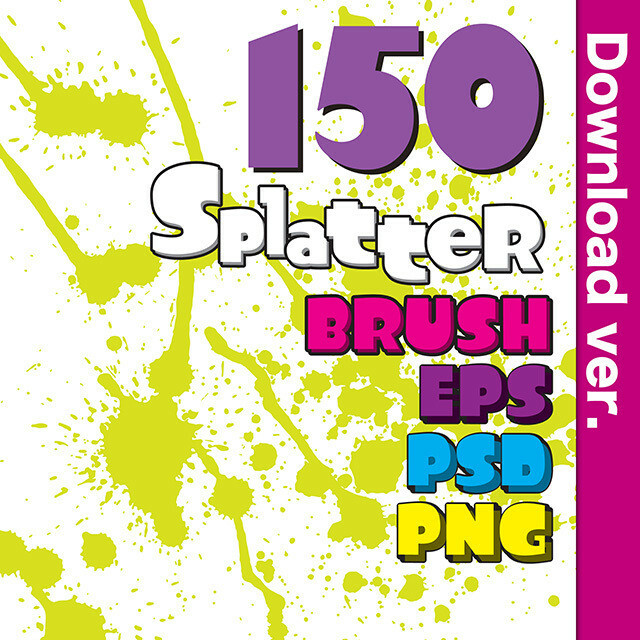 ★期間限定75%OFF★　¥400 → ¥100 しぶき素材集2-4／Splatter_Brush_2-4 しぶき、飛沫の素材を150種類。 パスを加工できるEPSも収録！ 水彩質感のあり／なし両方収録していますので、 マットなしぶきを使いたい場合も便利です。 ■収録枚数：300種類 ■解像度：400dpi ■収録形式：PNG（背景透過）／EPS（Illustrator9.0以降）／ABR（Photoshopブラシ） ■対応ソフト：SAI、Photoshop、Illustrator、コミスタ、イラスタ、Word、他 ■商用利用可、使用報告不要 クレジット不要です。 同人誌をはじめ、商業誌、グッズ制作、アプリ開発、webデザイン、ポスター、お品書きetc... 幅広くご利用いただけます。 ■禁止事項 転売、複製、共有、そのままweb上へアップロードする行為、加工したものを素材として販売する行為、その他法令に触れる行為。 ■発売日 2016.01.01 quantity: 150 resolution: 400dpi extension: PNG（masked）／EPS（Illustrator9.0）／ABR（Photoshop Brush） author: STARWALKER STUDIO license: PD (Public Domain) source: n/a - original work These textures are Copyright© "STARWALKER STUDIO". They have all been taken by our own cameras or created by ourselves. They are FREE to use for all uses, whether commercial or non-commercial. Feel free to take as much and as often as you like. You can NOT sell any of these textures in an unmodified form, or a modified form. You can NOT redistribute (give/send to somebody else/display on a web site) . 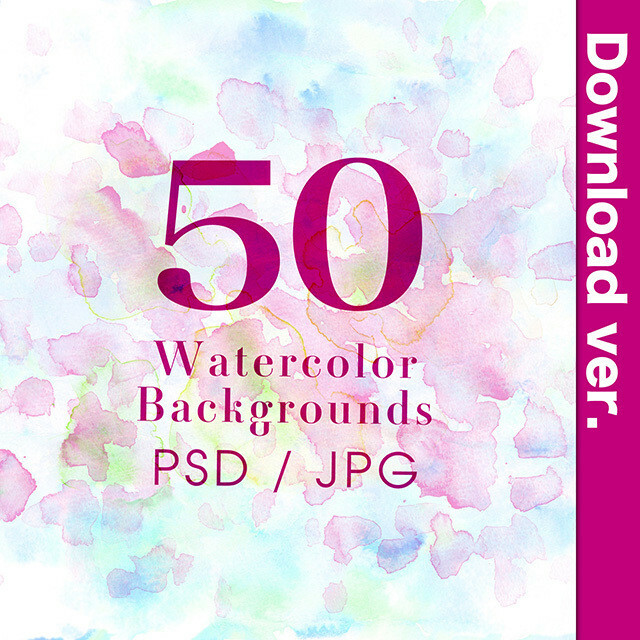 ★期間限定75%OFF★　¥400 → ¥100 水彩素材集3-1／Water_Color_PSD_3-1 パーツを分解できる、水彩の素材50種類。 レイヤー分けPSDを収録しているので、加工も自由自在です。 --------------------------------------------------------------------------- 『水彩素材集』と『透明水彩素材集』の違いについて 水彩素材集　→　レイヤー分解PSDを収録。パーツ分解できます。 透明水彩素材集　→　背景透過PNGを収録。 --------------------------------------------------------------------------- ■収録枚数：50種類（5 x 10カラーバリエーション） ■サイズ：A4 ■解像度：400dpi ■収録形式：PSD（レイヤー分解）／JPG ■対応ソフト：SAI、Photoshop、Illustrator、コミスタ、イラスタ、Word、他 ■商用利用可、使用報告不要 クレジット不要です。 同人誌をはじめ、商業誌、グッズ制作、アプリ開発、webデザイン、ポスター、お品書きetc... 幅広くご利用いただけます。 ■禁止事項 転売、複製、共有、そのままweb上へアップロードする行為、加工したものを素材として販売する行為、その他法令に触れる行為。 ■発売日 2016.01.01 quantity: 50 resolution: 400dpi size: 210mm x 297mm extension: JPG, PSD(Layers) author: STARWALKER STUDIO license: PD (Public Domain) source: n/a - original work These textures are Copyright© "STARWALKER STUDIO". They have all been taken by our own cameras or created by ourselves. They are FREE to use for all uses, whether commercial or non-commercial. Feel free to take as much and as often as you like. You can NOT sell any of these textures in an unmodified form, or a modified form. You can NOT redistribute (give/send to somebody else/display on a web site) . 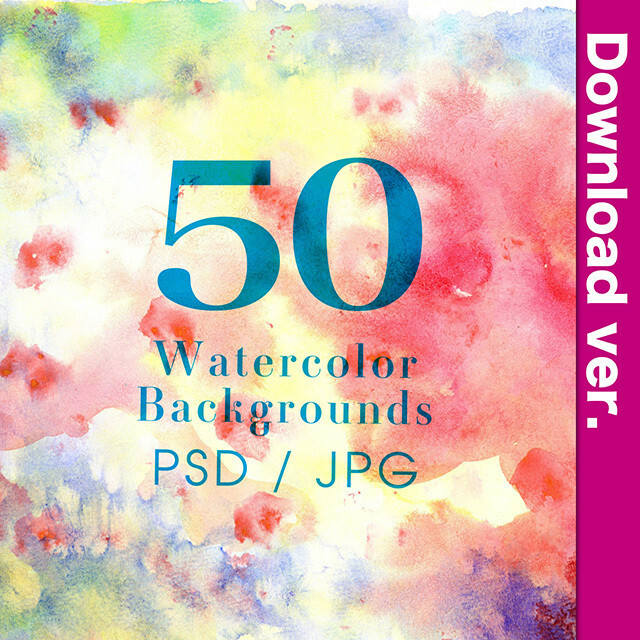 ★期間限定75%OFF★　¥400 → ¥100 水彩素材集3-2／Water_Color_PSD_3-2 パーツを分解できる、水彩の素材50種類。 レイヤー分けPSDを収録しているので、加工も自由自在です。 --------------------------------------------------------------------------- 『水彩素材集』と『透明水彩素材集』の違いについて 水彩素材集　→　レイヤー分解PSDを収録。パーツ分解できます。 透明水彩素材集　→　背景透過PNGを収録。 --------------------------------------------------------------------------- ■収録枚数：50種類（5 x 10カラーバリエーション） ■サイズ：A4 ■解像度：400dpi ■収録形式：PSD（レイヤー分解）／JPG ■対応ソフト：SAI、Photoshop、Illustrator、コミスタ、イラスタ、Word、他 ■商用利用可、使用報告不要 クレジット不要です。 同人誌をはじめ、商業誌、グッズ制作、アプリ開発、webデザイン、ポスター、お品書きetc... 幅広くご利用いただけます。 ■禁止事項 転売、複製、共有、そのままweb上へアップロードする行為、加工したものを素材として販売する行為、その他法令に触れる行為。 ■発売日 2016.01.01 quantity: 50 resolution: 400dpi size: 210mm x 297mm extension: JPG, PSD(Layers) author: STARWALKER STUDIO license: PD (Public Domain) source: n/a - original work These textures are Copyright© "STARWALKER STUDIO". They have all been taken by our own cameras or created by ourselves. They are FREE to use for all uses, whether commercial or non-commercial. Feel free to take as much and as often as you like. You can NOT sell any of these textures in an unmodified form, or a modified form. You can NOT redistribute (give/send to somebody else/display on a web site) .